Growing up I loved Thomas The Tank Engine. I collected many of the trains and I used to love driving them around a small track and along the carpet. Maxwell is now 3 years old and equally shares my love for Thomas. This year Thomas is celebrating his 70th birthday, for the past 70 years he has managed to make lots of friends. Thomas The Tank Engine is based on stories of the railways, Thomas & Friends invites children to enter a world of imagination on the island of Sodor . It’s an idealised world created by the Reverend W. Awdry, where trains are powered by steam… and they talk! With a strong community ethos typiﬁed by a universal willingness to help, practice good manners and hard work, Thomas and his friends continue to inspire, excite and entertain children for 70 years and beyond. Friendship remains at the heart of the brand with more engaging storytelling, more dynamic and compelling content and a whole host of new adventures for Thomas & Friends this year. As well as the launch of series 19 which features the No.1 Blue engine and his familiar friends James, Percy, Emily, Edward, Henry, Gordon, and the Fat Controller, this exciting milestone year sees the release of the mini-series Dinos & Discoveries as well as the new movie Sodor’s Legend of the Lost Treasure. As children embark on fun and exciting journeys with their engine friends, adventures unfold that lead to timeless fun and discovery. 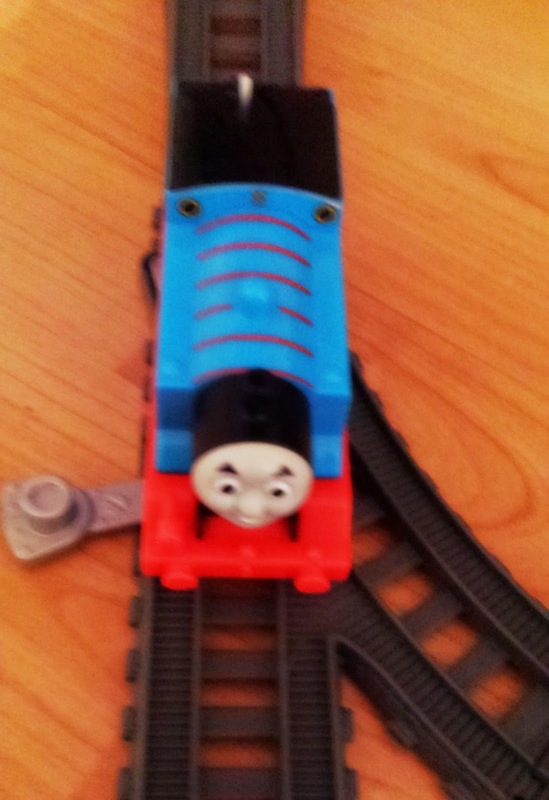 To celebrate Thomas's 70th Birthday, Maxwell has recently been sent a Thomas & Friends Motorized Playset to review. Along with the motorized play set, Maxwell was also sent a Samson motorized train to accompany Thomas on his adventures. The Samson motorized train included 2 trailers which both had colourful dinosaurs on the back. 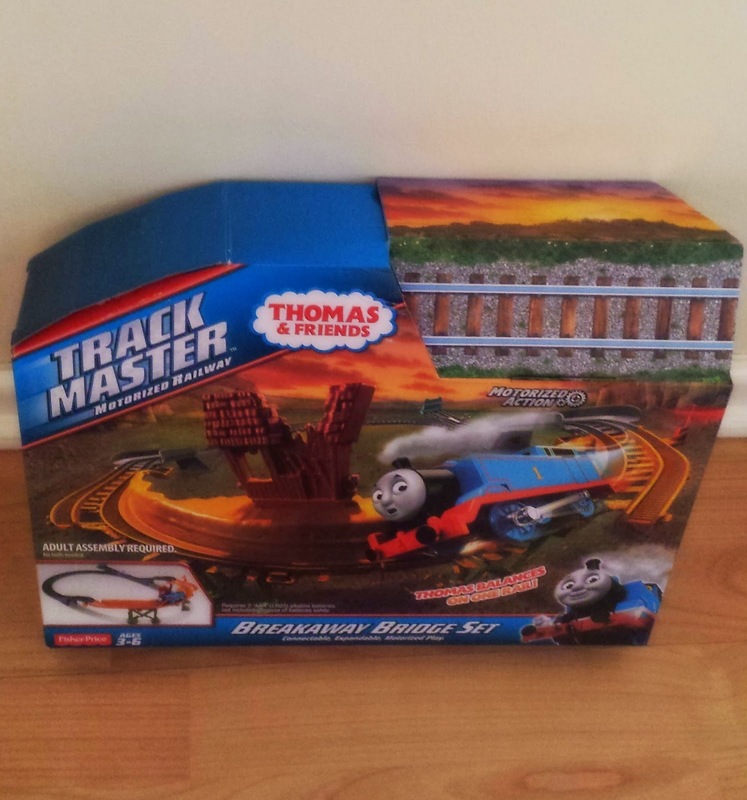 The Thomas and Friends Break Away Bridge Playset comes in a small box, the box has a limited amount of track inside which makes building easy for a child. 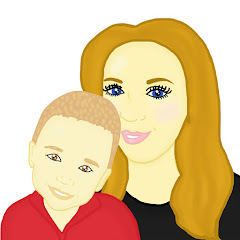 The toy is aimed at children aged 3 and above and I think that is the perfect age to aim the playset at. Once we had opened the box we built the track. There are clear instructions in the box to tell you how to build the track however we did not have to use these due to the fact the track was easy enough to build without. The track is thick, easy to slot together and very durable for small hands. Unfortunately Thomas, who was included in the Thomas & Friends Motorized Playset box came without batteries which meant we had to go to the shop to get batteries so he would work. Maxwell did find this a little disappointing as he hates waiting to play with new toys. Once the track was set up Thomas moved around the track easily and freely however there is a little twist to the track, there is a crumbling bridge! After Thomas speed around the sharp corner on the track, he was left to balance on a single rail as half his wheels come off the track! At first I was worried that Thomas may crash and leave Maxwell a little upset however Thomas easily moved around the track and managed to complete the whole trip around the track without any problems. 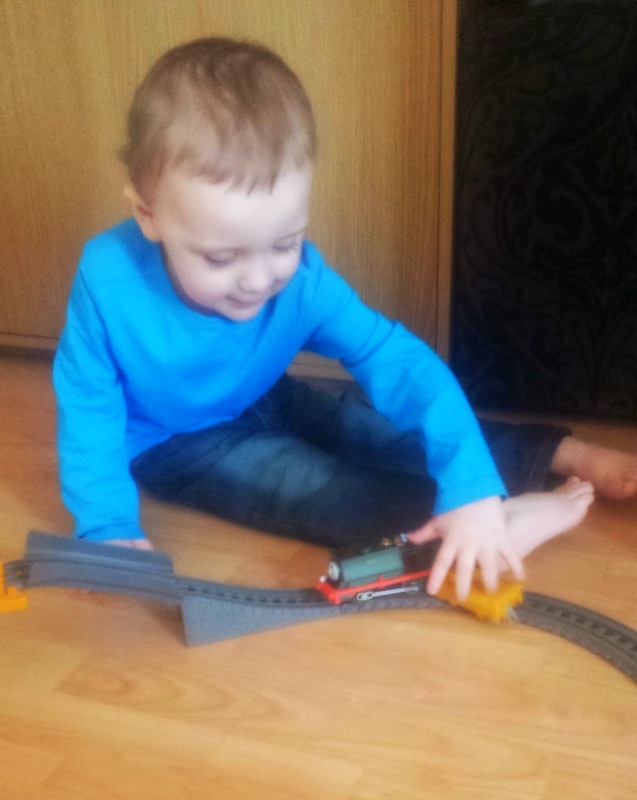 Once Maxwell had played with Thomas, we decided to get Samson out for Maxwell to play with. We placed Samson with his 2 trailers, along with the dinosaurs to roll around the track. Straight away I noticed that Samson was not rolling around the track freely and I think this was because the trailers kept sticking on the crumbly bridge. When Samson is not pulling his trailers along, he runs like a dream however when he is pulling the trailers he can fall off or get stuck. We have now decided that the trailers are better off not rolling around the track with the engines, this said they work great when we allow the engines to run on the floor. 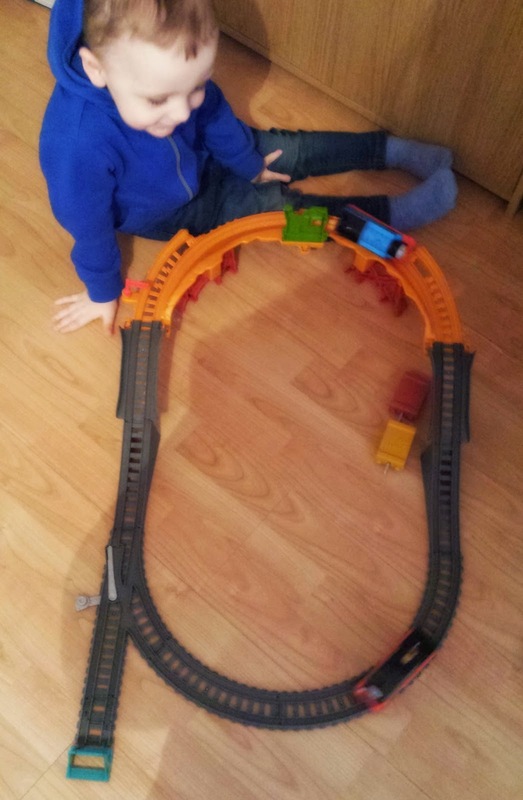 Maxwell adores playing and watching Thomas and Samson roll around the track. Maxwell gets very excited by the trains and he loves the fact that they chase each other down. He likes to shout encouragement to Thomas and loves to shout at Samson to tell him he must stop trying to catch Thomas! The Thomas & Friends Motorized Playset is a whole load of fun and Maxwell has so far spent hours playing with it. At the present moment the playset is priced at just £14.99 on Amazon which I think is a very fair price for the toy that you get. Happy Birthday Thomas and friends! I'm trying to remember now which anniversary it was when I bought my brother a gold plated Thomas! A true timeless classic!